When Nathan Filer won the Costa Book Award for his debut novel last month, The Shock of the Fall was all over my Twitter time line. Everyone was raving about a book I had heard little about before that day - my interest was definitely piqued. So when I was offered a copy for a review I didn't have to think twice as I was keen to see if it would manage to live up to the hype. Spoiler alert: it does. Main protagonist Matt's journey throughout the novel, from an innocent little boy to a troubled young man, was beautiful, fascinating, confusing, depressing yet ultimately incredibly touching. I've not read a book before that delves into a character struggling with mental illness into such detail and it has been a educational and rewarding experience. Even though it's fiction, it feels as if I've had the privilege to read another person's most raw thoughts and emotions, making Matt very vulnerable but also astonishingly real. The Shock of the Fall is the story of Matt in its most purest form. He tells his own story, in his own words and in his own time and as he does so we get intimately acquainted with his most private thoughts and struggles. While there is a focus on mental illness and it shows Matt's difficulties increasing as he grows up, this is foremost the story of Matt and his older brother Simon. Even though his brother dies when Matt is still a little kid, Simon remains an important presence as the years go by and this part of Matt's life show him and his family trying to come to terms with what happened all those years ago. I thought it was fascinating to read Matt's own words in the different types of media that were available to him when he was writing down his story; the different fonts translated really well within the novel and emphasised Matt's scattered thoughts and changing grasp on reality. And while initially his seemed a very straightforward and down-spiralling story there are quite a few unexpected twists along the way too, making this not only an emotionally satisfying novel, but also an intellectually satisfying one. The only reason I'm giving The Shock of the Fall 4 stars instead of 5 is that I read it straight after Wonder by R.J. Palacio. While the novels centre on different subject matters - main character Auggie from Wonder has a facial deformity making it much more a story about physical appearances and bullying, rather than the inward and often invisible struggle of mental illness - they're both stories about difference and acceptance, of others and of yourself. I believe that Wonder managed to convey that message in a slightly more moving and memorable way, and it personally touched me the most. 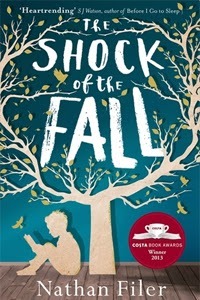 Had I not read these books straight after one another my perception on The Shock of the Fall would've likely been even more positive than it already is, as it truly is an extraordinary compelling, poignant and thought-provoking novel - and a deserving Costa Book Awards winner.